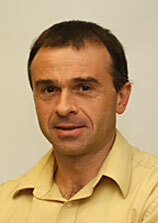 Didier A. Rajon, PhD, was born in France in 1964. He attended Pierre Mendes France University in Grenoble, France and graduated in 1984 with a Diplôme Universitaire de Technologie in computer programming and analysis. After several years of experience in software companies specialized in industrial processes for manufacturing industry, he attended a University-level preparation for entrance to the French Engineering Schools. He graduated with Honors in 1997 from the Institut National Polytechnique de Grenoble with an Engineering degree in Nuclear Physics. After a 6-month internship at the Nuclear and Radiological Engineering Department of the University of Florida, he enrolled in the Health Physics program of the department in January 1998. He graduated in December 1999 with a Masters of Science and went on to receive his Ph. D. in December 2002 for a study of image-voxelization effects on bone marrow dosimetry using Monte-Carlo computer simulations through Nuclear Magnetic Resonance images of the trabecular microstructure. Didier joined the faculty of the Department of Neurosurgery in February 2005 after a two-year postdoctoral research in the department. Dr. Rajon’s current research focuses on designing customized positioning fixture for neurological guided surgery from high-resolution multiplanar imaging data such as Computed Tomography. He also uses Rapid Prototyping technology to fabricate three-dimensional replica of patient anatomy for use in surgical procedure such as cranioplastic surgery.